I was pretty amazed to see IBM responding as recently as 16-Jan-2008 to the requests by the OS/2 online community to open source OS/2. I've admitted before to being an OS/2 fanatic for a few years, but seriously, I think we should let it die and just savour the memories! 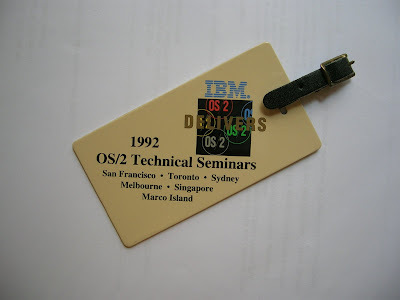 One of the great things about the OS/2 community way-back-when is that it was a total geek-out (memories of the OS/2 Devcon in 1992 - still have the bag tag!). Linux has I think long taken that mantle. .. mostly developed using REXX or my favourite compiler of the time: Borland C++ for OS/2! OS2IP - a project with a long-lost collegue Bryan Ryan (if you are out there Bryan - drop me a line!). At the time, there was no free TCP/IP stack for OS/2 Warp, so we set about writing one. Got as far as an NDIS packet driver, and a user mode frame interface before IBM finally got their act together and made us obsolete! Nevertheless, good fun hacking around with the Driver Dev Kit in assembler, and bridging to a C++ user-mode API. I don't think it was until then that I really understood Comer in detail. When you are working at that level, it is amazing how exciting exchanging just a few bytes of data in a chat application can be!